Tick another box off of Brad Treliving’s summer “to do” list: he has now locked up Lance Bouma for the next three seasons at a $2.2 million cap hit, giving the fan favourite ball o’ grit both term and money for his career year. What does the rest of the NHL have to say on his contract? When Mikael Backlund was re-signed, I looked at a handful of comparables to his cap hit; now, it’s time to do the same with Bouma. My personal hope for Bouma’s contract was that it wouldn’t go over $2 million, and if it did, it wouldn’t be for more than one season (due to future cap concerns for 2016-17, which are going to get very, very real if Brad Treliving is unable to remove dead weight from the roster). That… did not end up happening. Holy crap, Schwartz. This is his second contract, and he has one more year at that cap hit before he’s due for a new one. He is probably not going to stay in this pay range. Schwartz aside, Bouma is the youngest of this group, although a couple of other players – most notably Calvert and Hayes – are right within his age range. In regards to points per game, Bouma falls right in between them. 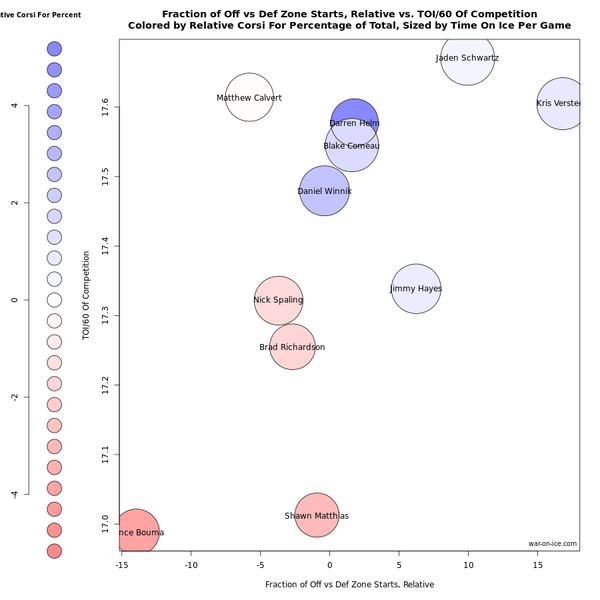 Although, Schwartz’s discount-thanks-to-youth aside, Versteeg looks like the best value player in this group. Spaling, the worst. In this cap hit group, Bouma is tied for sixth in points per game last season, along with Helm. That puts him in about the middle, and based on last season’s points totals alone, makes it look like the Flames hit a home run with this contract. The thing on that last bullet point – if this cap hit is to continue looking good, Bouma is going to have to do the exact same thing for the next three seasons. This could pose a bit of a challenge to him, as the season before, Bouma only scored five goals and 15 points over the same number of games. Over 110 more minutes of playing time this season, he put an additional 22 shots on net. Bouma spent about half the season in the top six, joining Backlund’s wing around the All-Star break and only relinquishing the spot when he mangled his finger while blocking a shot. The spot was immediately given back to him as soon as he was good to play again, which seems to indicate Bob Hartley likes him there. Could we be seeing a Bouma – Backlund – Frolik shutdown line? Given Hartley’s past configurations, not to mention just how much sense it makes to put Backlund and Frolik together, it’s certainly possible. And suddenly, things are looking a little less rosy. Bouma’s one odd year of points checks out with his new cap hit, but compared to those at his pay grade, he isn’t quite up to snuff. Let’s start off where credit is most earned: none of these players started in the defensive zone as much as Bouma did, so the fact he was able to keep scoring pace with them is impressive. On the other hand, he also faced the weakest competition of the group, so he should have been able to handle it. Now, the bad part. The colours are measured in corsi rel, meaning the fact that the Flames were a terrible possession team has no standing on Bouma’s numbers here; what’s taken into account is how well he fared compared to the rest of his team, not the rest of the league. Of the group, Bouma had the worst corsi. This is partly explained by his starting in the defensive zone so often, but he wasn’t trusted against greater competition at all, so he still should have fared somewhat better. Other players on this chart received more offensive zone starts, so they were a tad more sheltered. Of this group, Helm appears to be the best of the bunch. He scored at the exact same pace as Bouma, had middling zone starts, faced tougher competition, and drove the play north, all for a lesser cap hit. True, he’s older, so he doesn’t necessarily have the potential to grow like Bouma still does (although now that he’s in his mid-20s, that potential isn’t going to get much greater), but as it stands now, he’s the more valuable player. Winnik looks pretty good, too. Matthias is most comparable to Bouma here – easier zone starts, but still on the rougher end for this group, and a similar CF% rel – but he didn’t register quite as many points as Bouma did. He did have 18 goals, though. If he’d shot at Bouma’s shooting percentage, he’d have had 20. In short, if Bouma is going to repeat his 30-point performance, he’s probably going to need easier zone starts. As it stands, the play goes against him way, way too much, and at a level not seen for other players in this cap range. Bouma had a single good season and got rewarded for it with both term and money. When you’re making $775,000, there aren’t many expectations for you; at $2.2 million, there are. He’s now the seventh highest paid forward on the Flames. This past season, Bouma was used in a defensive role, which he did not fare well in; along the way, he saw a career high in goals dating all the way back to junior. He worked on his shooting, and his shooting percentage went up. Hopefully, it can stay up (or he could always just shoot the puck, or have the puck, more in general). Keep up his points totals. He’ll probably need to stay on Backlund’s line to do this, since Backlund enhanced his play, big time. With Backlund, Bouma posted a 45.2% CF. Without him, he was at 39.1%. Bouma was extremely dependent on him. Improve defensively. Yes, Bouma blocks a lot of shots and throws a lot of hits: an indication that he never has the puck. It’s better to have the puck than to not. If expectations are that Bouma is now a top six – or at least middle six – player on this team, then that’s an area he absolutely needs to improve in. That, or stop giving him so many defensive zone starts, so he can play in situations he’ll better be able to handle. History isn’t on Bouma’s side to live up to this new contract, but some of the numbers from his most recent season justify it as a solid cap hit. We’ll see which Bouma shows up over the next three seasons, and how much help he receives along the way. It’ll be the ultimate judge of this contract. Can the Flames fit Matthew Tkachuk and Noah Hanifin under the 2019-20 cap? You are simply talking in circles. Jeff in Lethbridge said that corsi was about luck. It is not. That is completely and utterly wrong. Corsi, Fenwick etc are about possession. That doesn’t mean “luck” doesn’t exist. There is luck, chance, uncertainty, inconsistency in everything. It’s a human condition. However, you’ll hear a lot more “old school” hockey people and advanced stats critics talk about “puck luck” and “getting the bounces” than advanced stats people; unless we’re talking about a stat that tries to quantify “luck”. You mention advanced stats then talk about Bouma’s shooting %. Shooting % isn’t an “advanced stat” and yes Bouma’s shooting % was abnormally high for him. He only shot 6.1% the year before. It’s extremely unlikely he’ll get anywhere close to 15.4% next year. Call it luck; call it whatever you want. It has nothing to do with advanced stats. And if you think the only people who think Bouma won’t shoot 15.4% next year are “advanced stats guys” you really need to get out more. Luck is no more involved in corsi than it is in any aspect of the game. The thing you and many can’t seem to figure out is that no one has ever said the “eye test” or any other factor should be excluded. That is nothing but an irrelevant tangent when your criticism has no merit. As for other people’s opinions…if you’re wrong you’re wrong. Corsi, Fenwick etc do not measure luck. Luck is not the driving factor that any advanced stats person talks about when discussing possession or corsi/fenwick. To say that is simply wrong. It is fact that there is a direct correlation between winning and good possession. Just like there is a direct correlation between good goaltending and winning. And instead of driveling about “luck” more critics should probably think about what aspects of hockey result in good possession numbers. Things like shot blocking, knocking the opposition off the puck, getting turnovers back, staying on the right side of the puck, winning battles in the corner, fore-checking, playing a 200 foot game. Zarny, I will give you this: you are one angry sod. I checked the analytics and sure enough, you have enough critical, insulting remarks to make you number 1 on this blog. And not only are you winning, as Kent would say you are running up the score. Good for you! Again with the irrelevant tangents. Always the go-to when you got nothing lol. I have a proposal for FN writers this upcoming year. Let’s amp up this argument a bit. There should be enough stats & data for the Analytics community to put these Possession stats to the test of predictability. I would like to see if FN can predict a decent sample size of players performance & predict teams outcomes based on possession metrics of the players & teams established historical possession statistics. I guess what I am hearing is Possession equates to the probability of being successful. Such a statement should allow predictions to be made based on the science of numbers. If done properly, the percentage of success in the predictions could be also used to measure the percentage of luck/injuries &so on. This could be the start of a new stat that could be argued measures luck & combined would enable an Analytics to predict historical possession numbers of players/teams combined & get close to predicting outcomes. I suggest we call this the Kevy Measure. But Jeff from Lethbridge, you have fought & defended the luck component, it probably should be called the JFL Measure. “Advanced” stats should be re-named “additional” or “enhanced” stats. In reality there is nothing “advanced” whatsoever about measuring how much a team possesses the puck, that’s hockey 101 and something coaches have always been cognisant of for decades. Roger Nielson was a well known advocate of this information (in conjunction with all other components of evaluating performance) back in the 80’s. The online stats community of recent years to gain attention and relevance has termed it this themselves to justify their “superior intellect” and existence. If you market anything a certain way it will get you paid…well done to these guys, very solid gimmick.